"Excellent quality doors completely transforming our tired bathroom cabinets. Highly recommended." Kitchen doors fitted and look fantastic really pleased thank you to you and your staff. On placing the order via telephone, I found the service to be very efficient. Having first placed an order for one door, I made a further call to place an order for a second door which was able to be linked to the first order incurring only one delivery charge. The person on the phone was very helpful and polite. I was extremely pleased with the product as there was no difference in the colour from the existing doors to the new doors. I would certainly recommend this Company. I was very pleased with the product and with the service I received. Thank you. I ordered my first set of kitchen doors, draws & side panels about 2 years ago, they were easy to fit, they had a great finish and were very well made. They completely transformed my tired and dated old kitchen and that definitely helped me sell the house. I was so pleased I decided to refurbish my kitchen in Spain, even with the cost of transport it was still cheaper than getting the items made in Spain, so I shipped everything over. I really could not have asked for a better service, product, price or delivery. Very nice genuine people to deal with and I highly recommend them. Many thanks for the doors they arrived in very good order & fit a treat. A very professional service, friendly and helpful with regard to the order. Very pleased with the quality of the bathroom cupboard doors, toilet and sink panels and bath panels. I would say that this company is a Gem. I found them through extensive research online. Their Customer service and delivery was first class. Everything regarding the product was exemplary. I would not hesitate to reorder from this Company nor indeed recommend them to others. I was really impressed with everything, from the speed of the initial quote to the delivery all cut to the right size. The photo above shows what I did with the panels I ordered from KBB. HIGHLY RECOMMENDED. 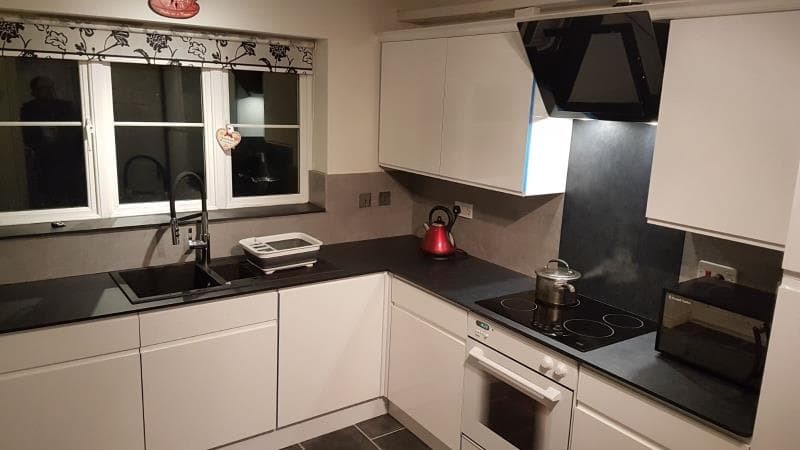 The replacement doors have transformed my kitchen 100%, the quality of these doors and door fronts is excellent, I wood definitely use KBB again and would have no problem recommending them to anyone. Top class service along with top class product, could not fault their commitment to satisfy. Really happy with the quality and service provided by Warnock at KBB. My kitchen looks amazing after purchasing my white high gloss doors and I cannot thank you enough for all your help. Ordered 2 doors for vanity unit. Arrived promptly,were of good quality and sizing was spot on. Intend ordering some kitchen doors in not too distant future. I was looking to replace the front panels on my bathroom drawers that had become damaged due to a leaky tap, this was the only company I could find that make MDF satin gloss covered panels made to measure. The service was very good, price was good - certainly cheaper than replacing the whole under sink cabinet. Overall I would highly recommend. I have nothing but praise for your product and the staff that helped me through the purchasing process. Delighted with the new kitchen doors. Excellent quality and was kept up to date throughout the ordering and delivery process. The new doors have completely updated a tired old kitchen. Absolutely delighted with the quality of the doors. The respray was excellent and colour matched the rest of the doors.. The advice given was the best of all the kitchen suppliers and the most appropriate for our needs. 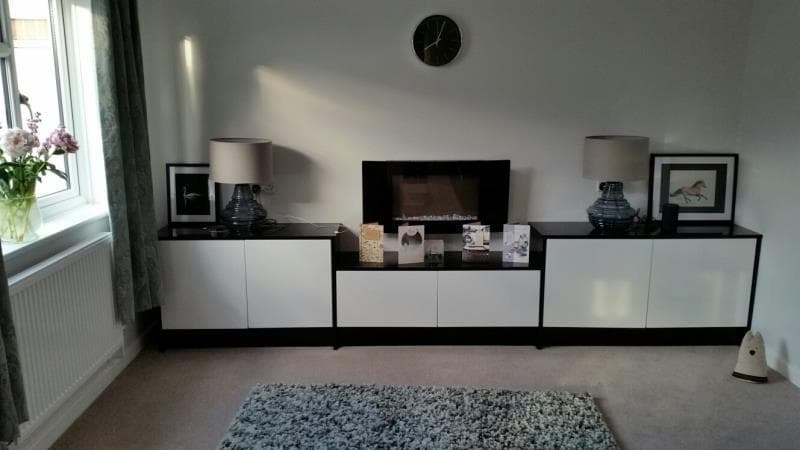 Did my kitchen in the gloss white great product, with excellent customer service and delivery. Very pleased with how my new kitchen looks. I found the website very easy to use, and was able to customise the door and hinge positions to match precisely what I needed. The product was delivered very promptly and was exactly as ordered. Good quality door, and we will almost certainly order some more in the future.